Whilst this is not an obituary in the normal format, it is a bit of Club history of Sid and Yvette during the period that they were Club members and opened their home in Webb Street, Cottesloe for Club activities from the early 1960’s until they returned to England in 1965. I was introduced to the Club by member Albert Vanstan, whom my mother knew from her primary school days. Albert had a layout which over the 16 years I knew him till his death in 1978 was rebuilt twice by another club member, the late Allan Hamilton and myself. I digress; Albert had been a Club member for some time and it was at the Harveys’ home, where the Club was meeting that I was taken to early in 1965. They had a small layout on the covered in side verandah at their home which was made available to Club members on meeting nights. An article from The West Australian, Wednesday, 29 May, 1963 showing the WAMRC layout in the Harvey’s home in Cottesloe. Sid and Yvette were also members of the Australian Railway Historical Society (now Rail Heritage WA) where Sid was Treasurer from 1961 to 1965 and Yvette was also a strong supporter in the Society. Both were honoured with Life Membership of ARHS before they returned to England. During their time in Western Australia, Sid worked for Winterbottom Motors, an Agent for Austin and Morris motor vehicles. Fellow Club Life Member Alan Porter, who knew Sid and Yvette from their Historical Society days in WA, was working in London in 1970 and had heard of a railway group meeting called “Talking Trains” that was being held in Surbiton (a London suburb). Alan attended one of the meetings which had been organised by a gent well connected in railway circles in the UK (John Spencer Gibbs) and he caught up with no other than Sid and Yvette Harvey who were also attending the meetings. At that time the Harveys were living at Kingston‐on‐Thames, near to London. In 1972 on my first trip to the England, I visited Sid and Yvette at their new retirement home, St. Barbara Cottage, Church Lane, Great Walsingham in Norfolk in late July. “N” gauge was quite new at the time and Sid proudly ran some of his “N” gauge locos on the small layout he had constructed. 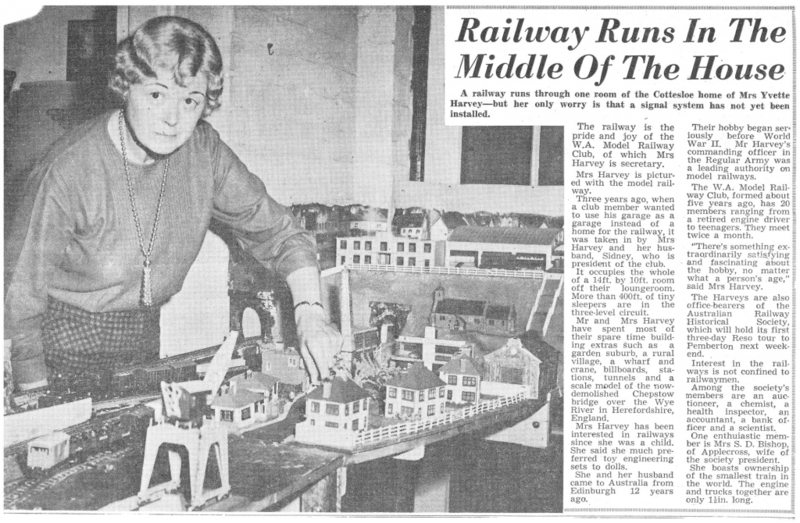 Yvette too was keen on modelling but her skills were in the scenery side of things, making buildings and trees. 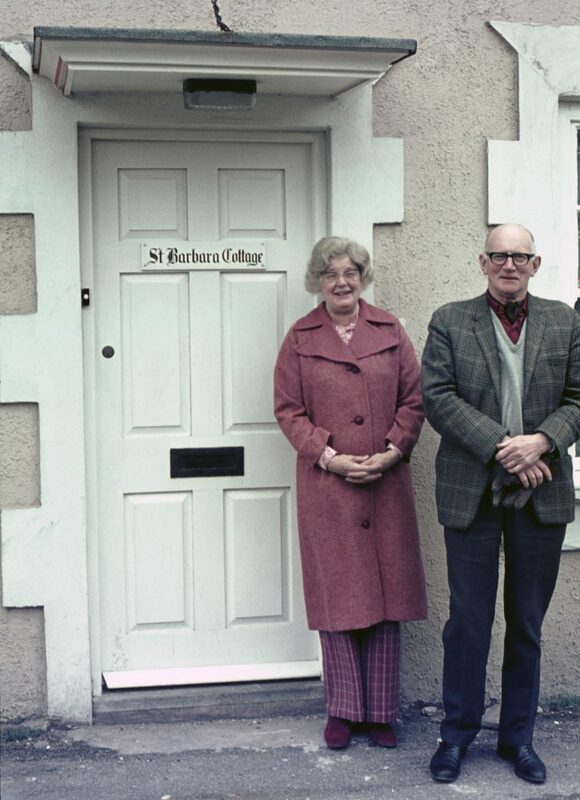 Sid & Yvette Harvey outside their home “St Barbara Cottage” in Great Walsingham, Norfolk, England in May 1973. Photo courtesy of Geoff Higham. At our Club AGM some years later (in 1980) members discussed the assistance given to the Club by the Harveys and voted to offer Sid and Yvette Harvey Honorary Life Memberships, in appreciation and recognition of the time and work which they both had put in during the Club’s “difficult days” in the early 1960’s. Mention was made to them in a letter of Albert Vanstan, whom they remembered as “a good Club member”. Albert died in 1978 and his layout (which was bequeathed to Club member Allan Hamilton) found its way to the Club, was incorporated into the public display and called the “Vanstan layout”. On this section of the layout we introduced the very popular “U drive a train” theme where children could drive a train. It was decided that a miniature replica electric staff for the Harveys be for the Elleker — Vanstan section of the layout. The miniature staff with its timber base was delivered to the Harveys by Alan Porter (then Club President) on July 17 1983, during Alan’s visit to England. As both Sid and Yvette were not young people when they returned to England, both would now have passed on but I have not been able to establish when they died. As a collector of railway items and old telephones, I recently purchased a single line staff token, from a secondhand shop, whilst on holiday in Cromer, Norfolk, England. 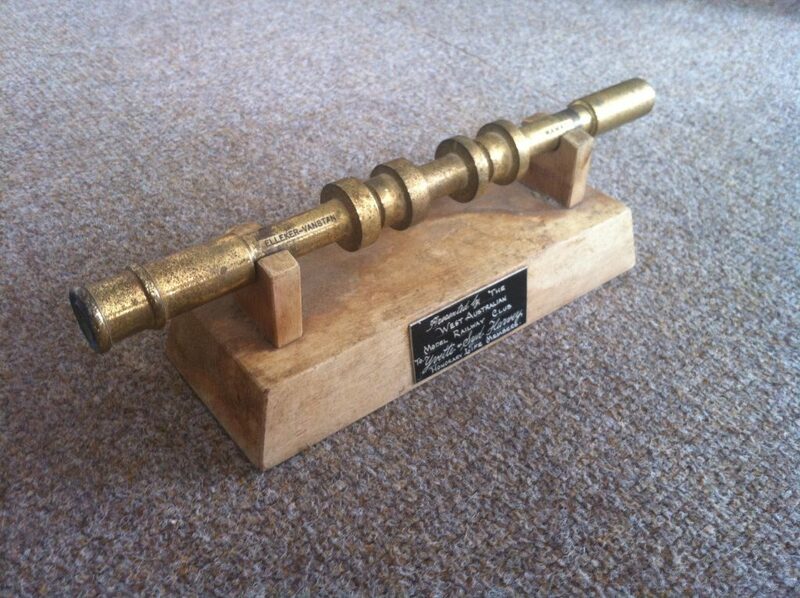 This brass staff has a purpose built stand, and a plaque. 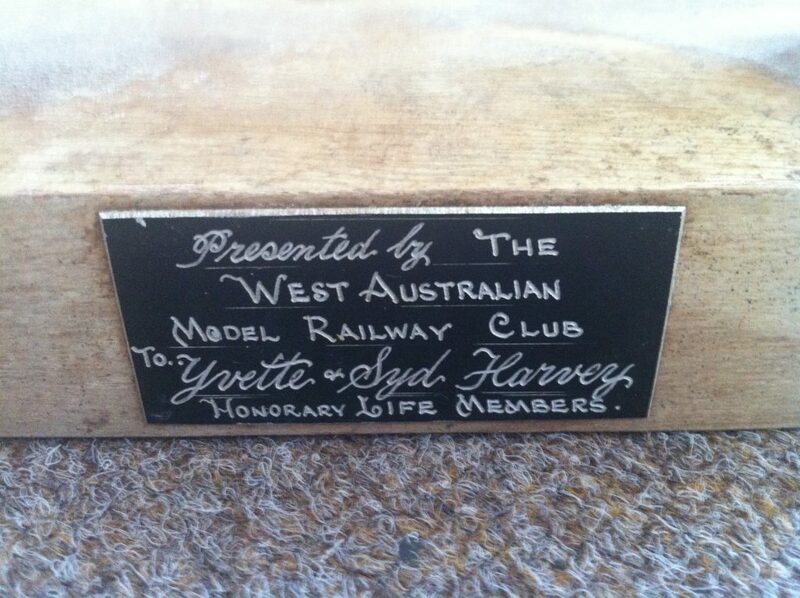 This states that it was presented by the West Australian Model Railway Club, to Yvette and Syd Harvey, Honorary Life Members. The staff itself is engraved Elleker‐Vanstan and WAMRC. I am curious about the history of the actual staff itself, and its use, but also by the history of the two named individuals, who I see are sadly no longer with us. I am also curious as to why it should have turned up in Norfolk. I am wondering if it would be of interest to your club. I can send some photos if you like. The commemorative staff as found by Mr Steve Walker‐Manuell. Close up of the plaque. Once the history of the staff was established, Mr Walker‐Manuell was very generous to donate it back to the club for only the cost of postage from England for which we were extremely grateful! The staff has been restored to its former glory and remains on display to this day in our clubrooms.